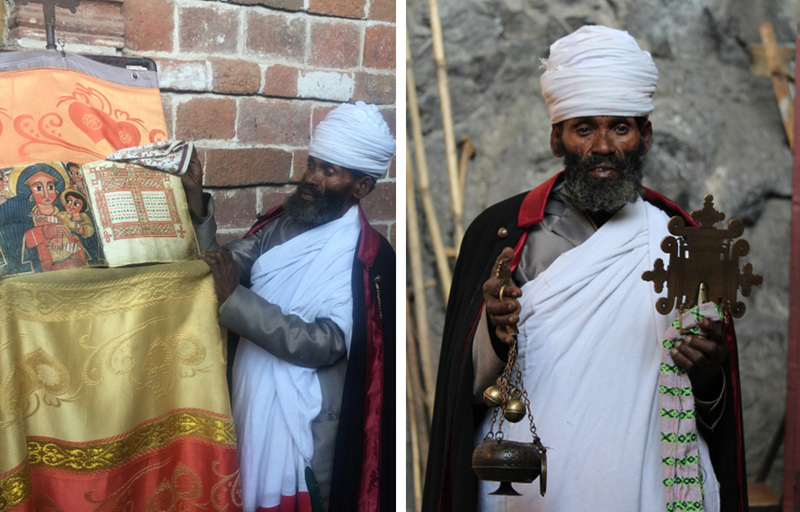 With a unique landscape, a native script, its own church (Ethiopian Orthodox, the oldest national Christian church in the world) and even its own calendar, Ethiopia is unlike anywhere else on earth. Always my favourite destination for hosting fam trips, the pleasure lies in seeing travel experts arrive in the country not knowing what to expect and return home passionate ambassadors for this emerging tourism destination. The rendezvous for our fam trip ‘dream team’ was Heathrow Terminal 2. Introductions took place over a few friendly beers before embarking on the seven-hour flight to Addis. Ethiopian Airlines had managed to organise upgrades for our group so there was much excitement about being able to experience their Cloud 9 Business class. The extra comfort was much appreciated and served us well in preparation for our jam-packed itinerary. 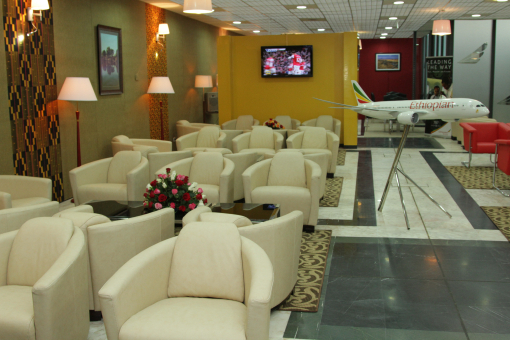 All of the Ethiopian Airlines (ET) fleet are under 5 years old & our plane looked brand new! They now fly to over 100 different destinations and have the largest pan-African network. ET are growing at an average of 25% year on year and naturally with an airline growing this fast it is important that their hub can service the volume of traffic coming through. Addis airport is currently being upgraded (including recently launched free wifi) with the new terminal due to open in January 2018. The ﬁrst scene or smell that hits you when arriving in a new city always makes a lasting impression. 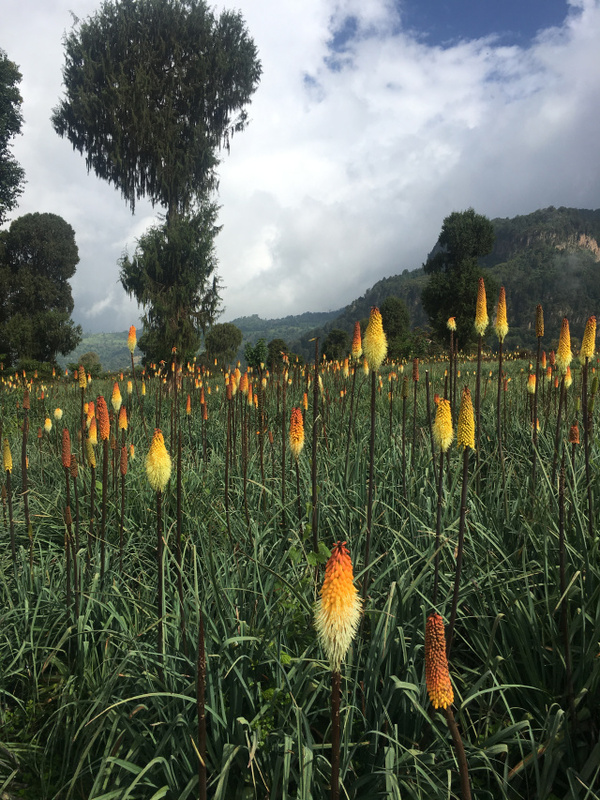 In Addis it was a double whammy of a welcome: we were instantly enveloped by the smell of spring flowers and the beaming smile of our Kibran guide, Dawit. 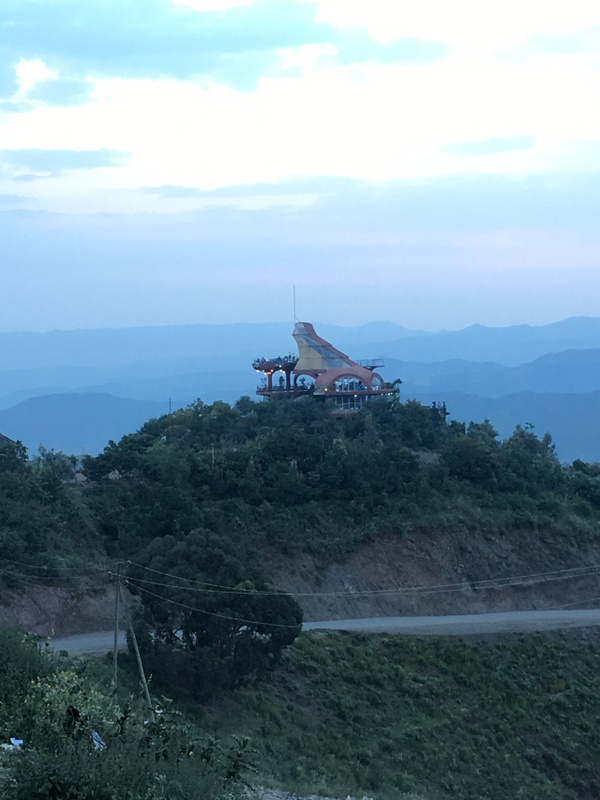 Wasting no time in filling us in on the facts about our new surroundings, he whisked us off to breakfast at the Radisson Hotel where we met Assefa, the MD of Kibran Tours – our co-hosts on this trip, along with Ethiopian Airlines and Bale Mountain Lodge. 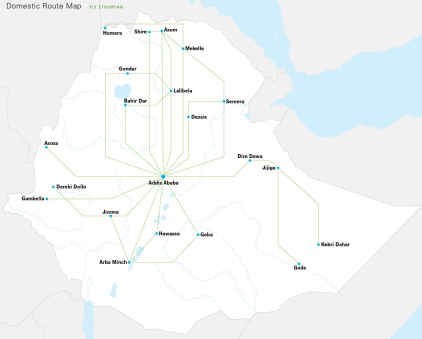 With a population of 4-5 million and growing, Addis Ababa is Africa’s fourth-largest city and the continent’s diplomatic capital. The city is only 15 mins from the airport making it a doddle to access although many visitors choose to transit out of the city as quickly as possible. However, if you are willing to linger, you can happily spend a day exploring the museums of Addis (where you can visit ‘Lucy’, who is 3.2 million years old) or sample the offerings of the countless Ethiopian eateries. With our bags checked through to our first destination, Bahir Dar, we were able to travel to breakfast with just our boarding passes before heading back to the airport for our 45-minute internal flight. It’s worth noting, when you buy your international flights with Ethiopian Airlines, your domestic ones are hugely subsidised. Bahir Dar is the capital city of the Amhara region in northern Ethiopia and, with palm trees lining the streets and hotels on the shore of Lake Tana, it has a distinct holiday vibe about it. We were staying at the Kuriftu Resort & Spa. The resort is relaxed and the rooms are large, although some were a little dark. The spa comes highly recommended, especially if you want to unwind after a day’s travelling. Re-charged after a delicious lunch of salad and tilapia caught fresh from the lake, we set sail on our boat cruise to visit the monasteries on the various lake islands. Lake Tana is the source of the Blue Nile, although its waters are more brown than blue! 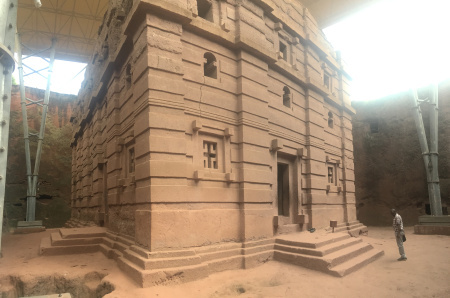 There are two renowned monasteries on Lake Tana but we visited only one – Ura Kidane Mihret. The boat takes about an hour to cross to the islands and then it’s a pleasant 20 minute walk through the lush island woods to reach the monasteries. 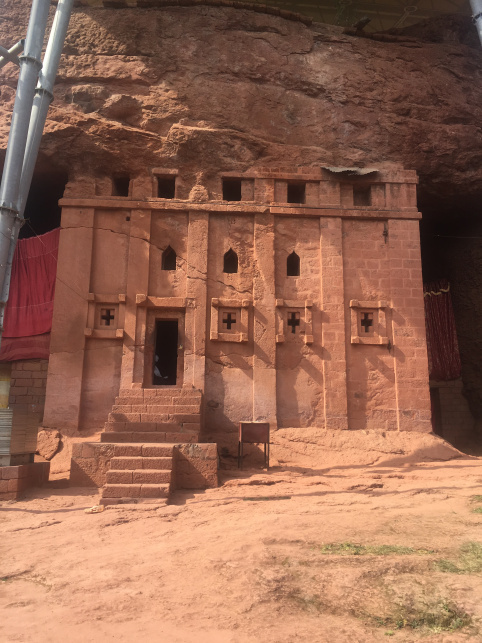 While architecturally the monasteries can’t compare to Ethiopia’s famous rock-hewn churches, they are still beautiful, decorated with wonderful paintings depicting scenes from the Old and New Testaments. My previous trips to Ethiopia have taken place in March when it was far drier and dustier. Visiting in September meant I could see firsthand how green and lush the landscape can be as well as appreciating the region’s many stunning spring flowers. 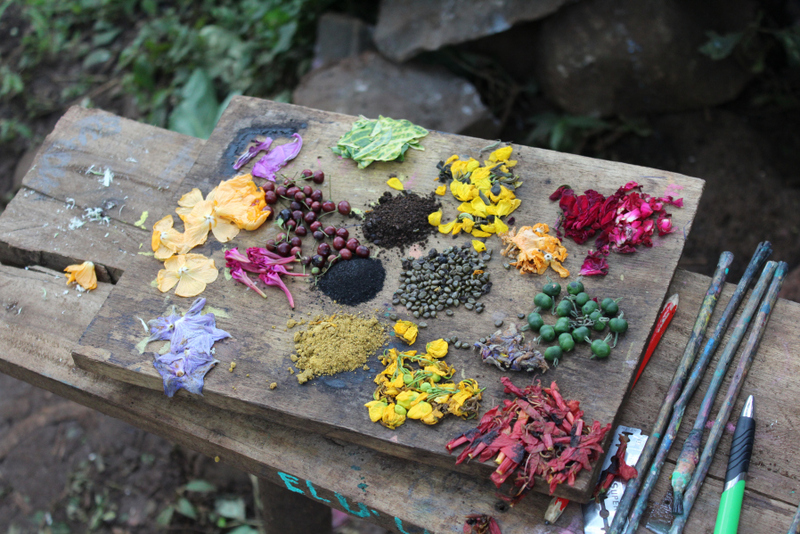 It was lovely to see the artists lining the pathway to the monastery and to admire their paintings inspired by the vibrancy of these natural colours. 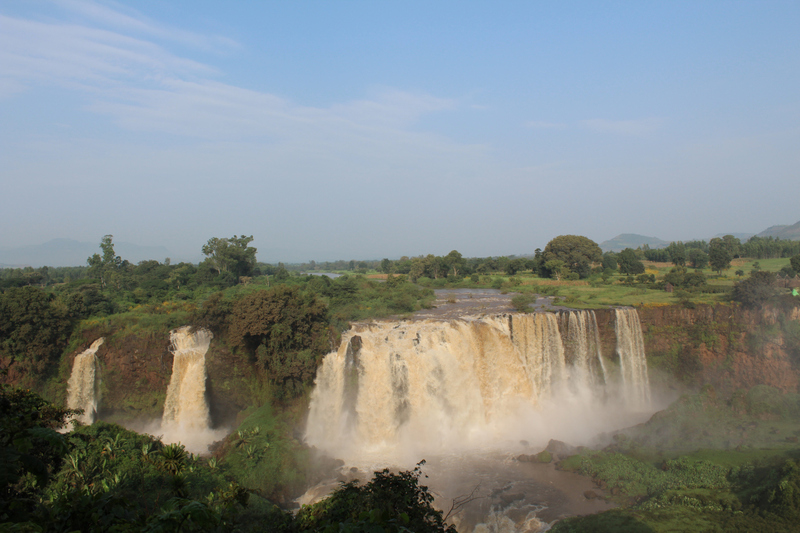 An early start meant we could squeeze in the chance to see the Blue Nile Falls before leaving for Gondar. Normally guests wouldn’t depart at 6am to visit the falls but we all agreed that our sunrise start was definitely worth it: the early morning haze created an etherial filter over the verdant landscape. The drive takes around 1.5 hours and then the walk to the falls themselves is around 30-40 minutes. Leaving early ensures you’re walking in the cool of the day and it means you beat any “crowds”. The Falls are known as Tis Abay in Amharic, meaning “great smoke”. Over 400 metres wide when in flood and dropping over a sheer chasm of more than 45 metres deep, the falls throw up a continuous spray of water which produces rainbows and a perennial rainforest of green vegetation that’s home to monkeys and beautiful birdlife. Our next stop was Gondar. 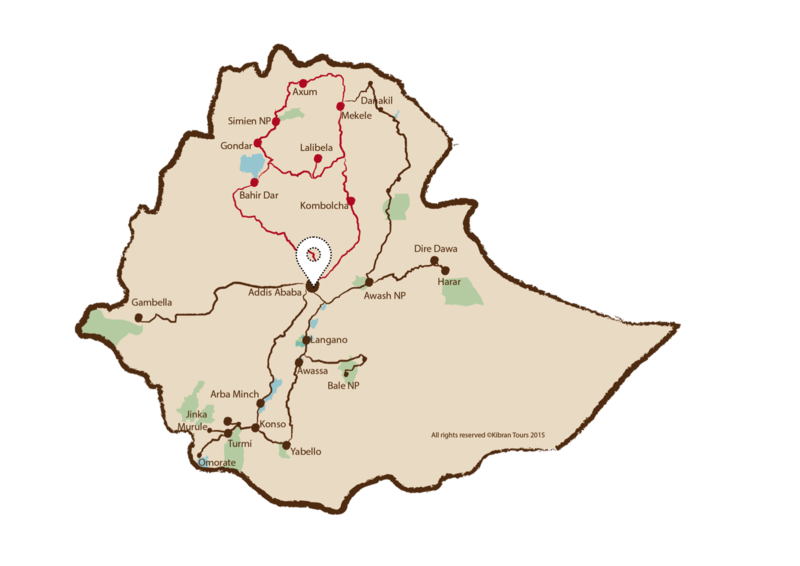 The drive from Bahir Dar takes around 2.5 hours along excellent roads and past stunning scenery. Our lunch venue was the Four Sisters restaurant in Gondar. A typical Ethiopian restaurant, it might be touristy but it’s a brilliant place to tuck into some local food. 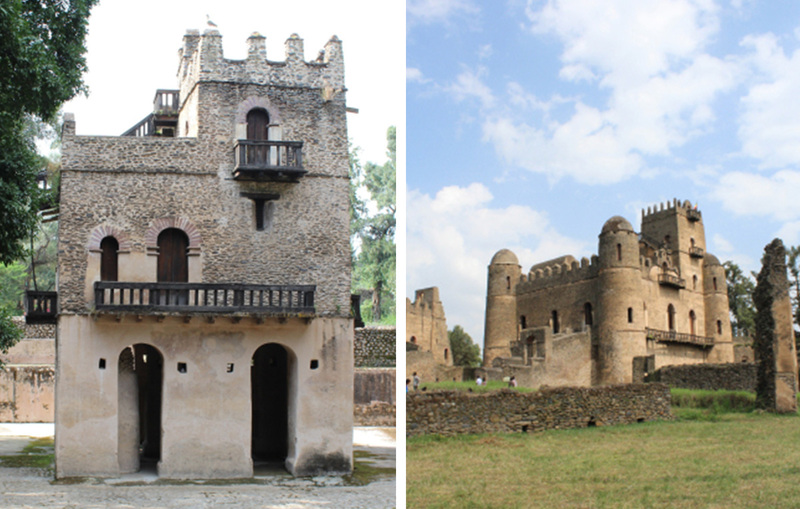 Lunch was worked off by exploring Gondar’s famous castles. Known as “the Camelot of Africa”, the city was the first capital of the Ethiopian empire, which began back in 1632 with the reign of Fasilides. The Kings of Ethiopia continued to base their power here for two centuries. Home to a host of medieval churches and castles built by various Emperors over the course of 236 years, many of the buildings and picturesque ruins lie in the World Heritage Site of the Royal Enclosure so they are easy to amble around. About 2km northwest of the piazza lies Fasiladas’ Bath. The large rectangular pool is overlooked by a charming building, thought by some to be a vacation home. It’s a calm, beautiful spot, where tree roots snake along sections of the stone walls. The Simien Mountains and Limalimo Lodge was our final port of call for the day. 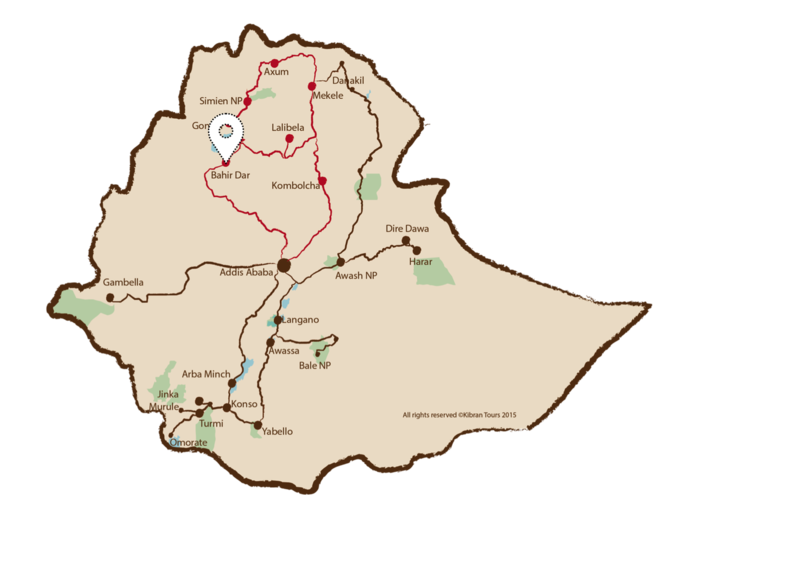 The drive took 2.5 hours along excellent tarmac roads which explains why Ethiopia is becoming such a popular cycling destination. I was particularly excited about this Limalimo leg of our trip. Having worked with the team to launch the property, this was to be my first actual visit. 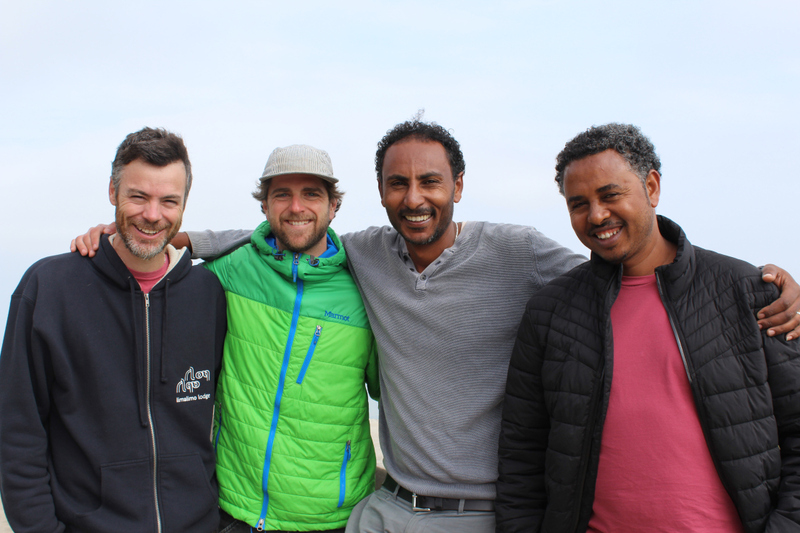 Campbell, the American manager, was there to greet us along with directors, Lucas, Shif and Meles. Julia, the co-owner of Limalimo (& wife of Shif), normally manages the lodge but she is currently in England awaiting the arrival of their second baby. 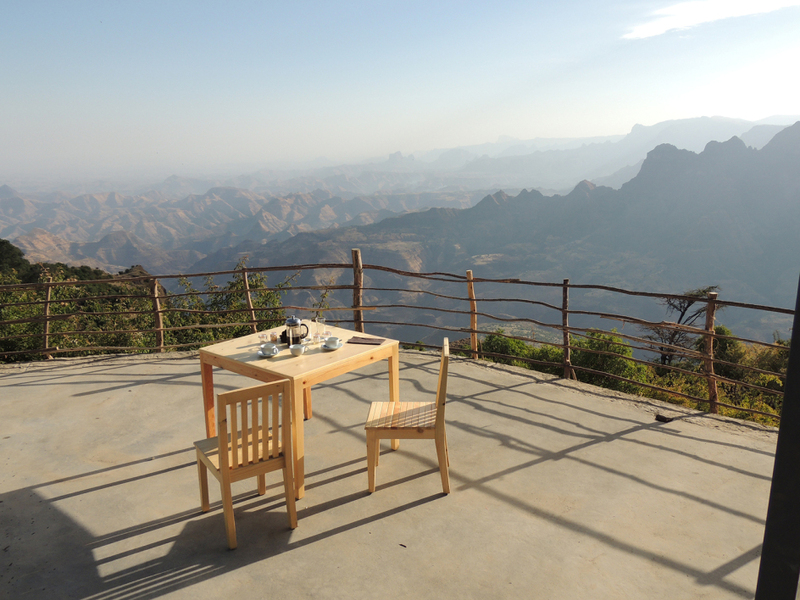 Limalimo is perched on the edge of an escarpment with views of the Simiens stretching as far as the eye can see. 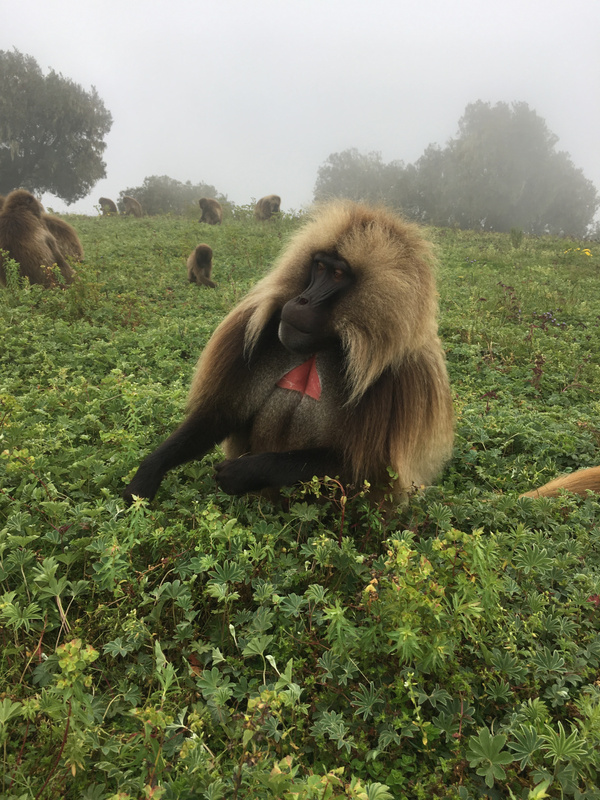 The realisation of a dream for two native Simien mountain guides – Shif and Meles – who grew up in this precious place, they wanted to be part of a project that would help preserve the wildlife and spectacular scenery they’ve loved for decades. Working in partnership with the African Wildlife Foundation, from the outset the lodge sought the emotional buy-in of the surrounding community to ensure their involvement and that they benefit from contributing to the future wellbeing of the National Park. Almost all the staff are from the two neighbouring villages, with the majority of them having built the bar, restaurant and bedrooms they now work in. As many ingredients as possible are sourced from the local area and there are plans to team up with the farmers to grow a selection of vegetables for the lodge’s kitchens. The bar and restaurant are perched on the cliff edge with a sweeping terrace. 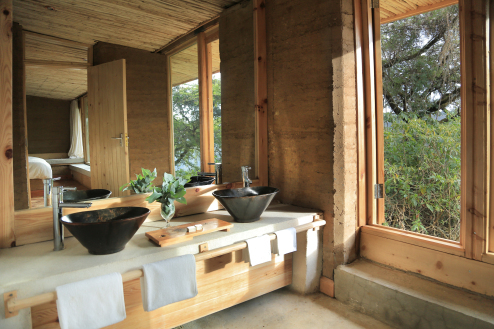 Constructed using rammed earth so they blend with the landscape, the rooms are in cosy cabins scattered over 10 hectares of grounds allowing guests to luxuriate in the peace and privacy of their surroundings. The design is minimalist and the en-suite rooms have windows that run the full length of the space to bring the beauty of the outside inside. With 12 rooms the lodge is small but the fact that they are already running at 80% occupancy after one season means that they are looking at adding a few more. The beds are among the most comfortable I have ever slept in with thick duvets and heavenly mattresses. 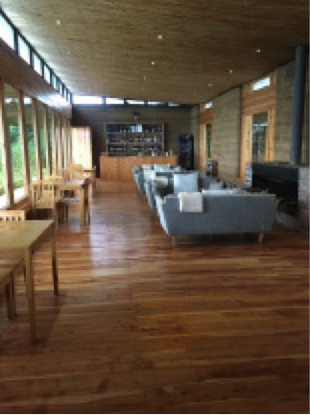 To ensure the lodge operates with minimal environmental impact, investment has been made in bio-waste technology while hot water, heating and electricity are generated using renewable energy sources. Recycled water irrigates the gardens. Chatting to Meles over a dinner of piping hot carrot and ginger soup and delicious creamed chicken, we got a real sense of what a long journey this has been for the Limalimo team and how encouraged they have been by the support and success it’s received. A splinter group decided to brave the early morning chill to see the sun rise over the Simiens. Unfortunately, clouds did their best to thwart the sun’s efforts to dazzle us but that didn’t deter from the magic of the vast views laid out before us. 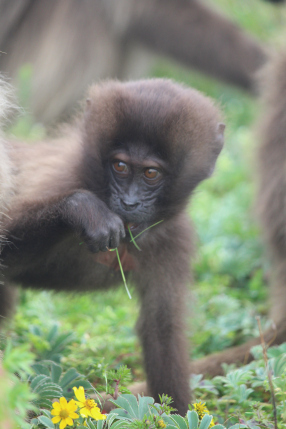 Bidding farewell to Limalimo we made for the Simien Mountains National Park. While Limalimo has plenty of walks immediately surrounding the lodge, its location is just outside the national park so it takes about 20 mins to drive to where the majority of the hikes are. 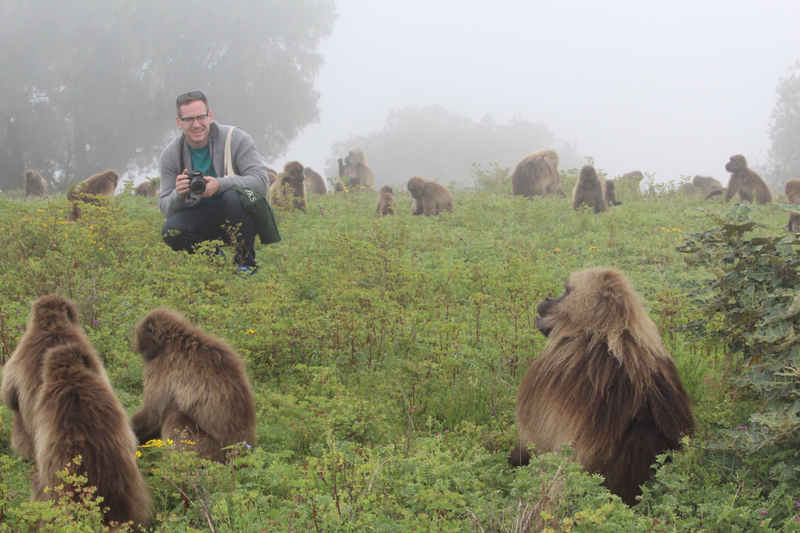 We met our requisite local park guide and ranger and headed off in search of the Gelada Baboons. Sadly, the same mist we’d seen at sunrise had thickened and hopes of drinking in views of “Africa’s answer to the Grand Canyon” were dashed. However, together with the giant heather and scent of wild mint filling our noses, the poor weather made for a mystical mood. 10 minutes into our walk, our guide pointed to a large troop of around 200 baboons. He reassured us that they were at ease with humans and that we could happily go to within a metre of them but nothing prepared me for quite how relaxed they were. The Gelada baboons are sometimes called bleeding-heart monkeys because of the males’ red, heart-shaped chest patches. My very own David Attenborough moment came as I’d settled myself among them. Distracted by the baboons’ 80’s pop star manes, a large Alpha male crept closer. Observing me casually, he suddenly stood up and walked straight towards me, brushing my side as he passed by. I have never experienced a wildlife encounter as intimate or restful as this. Swathed in mist and the air filled with their cooing, baby-like gurgles, the troop comfortably accepted us into their territory where, for nearly two hours, time stood still while we watched them go about their daily routine of grooming, playing, eating and mating. 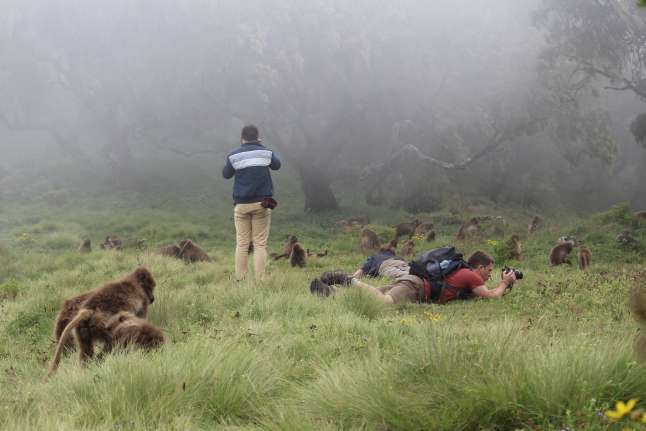 Reluctantly we tore ourselves away from the baboons and headed to the Simien Mountain Lodge for lunch. 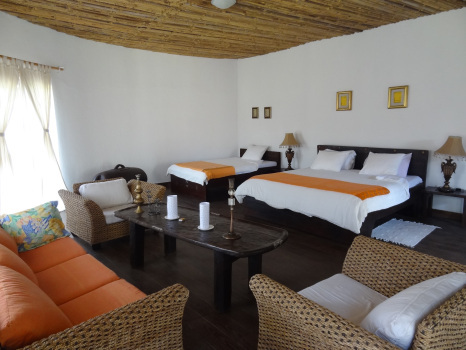 The Lodge has been open for 11 years and is built in a totally different style to Limalimo. Far more traditional in its stone and thatch design, the rooms are spacious but it seemed a shame that none of them had been designed to take in the lovely view from the lodge. 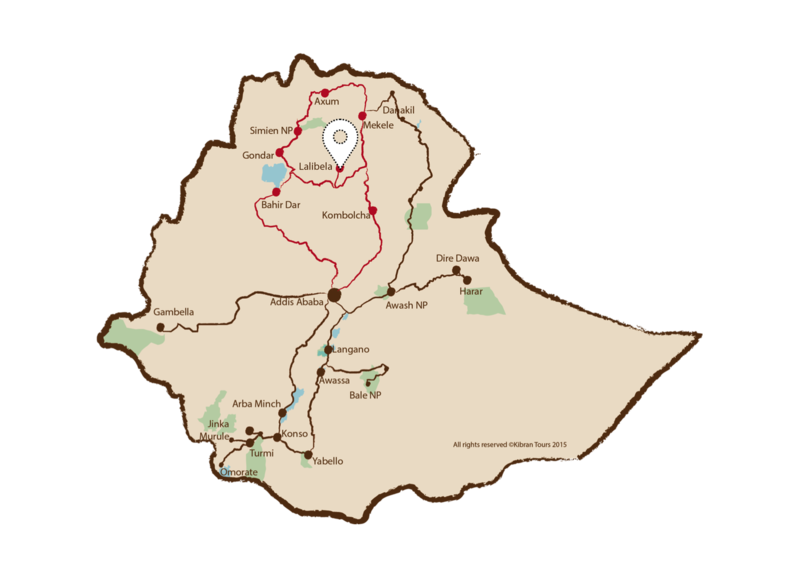 We headed back in the direction of Gondar to Mayleko Lodge which was our resting place for the night. Mayleko is a sweet 18-bedroom property about 15km out of town near the airport. 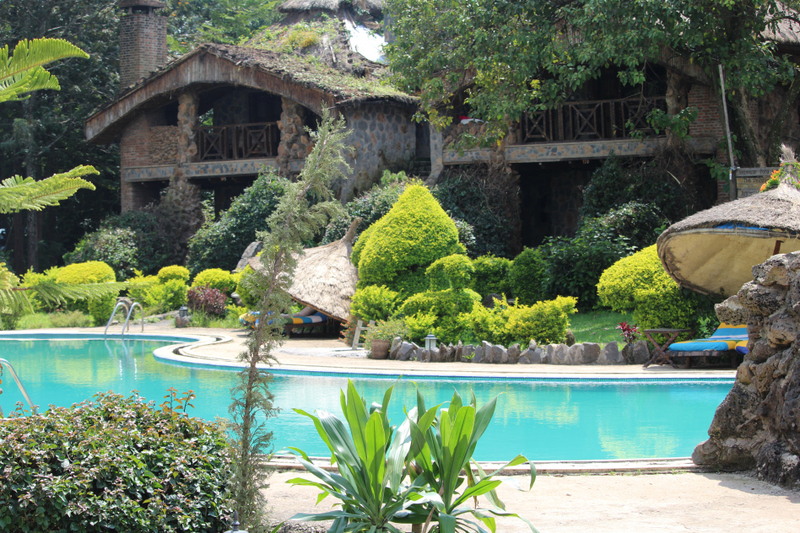 It’s ideal for an overnight stay if you are catching the morning flight from Gondar the next day, as we were. 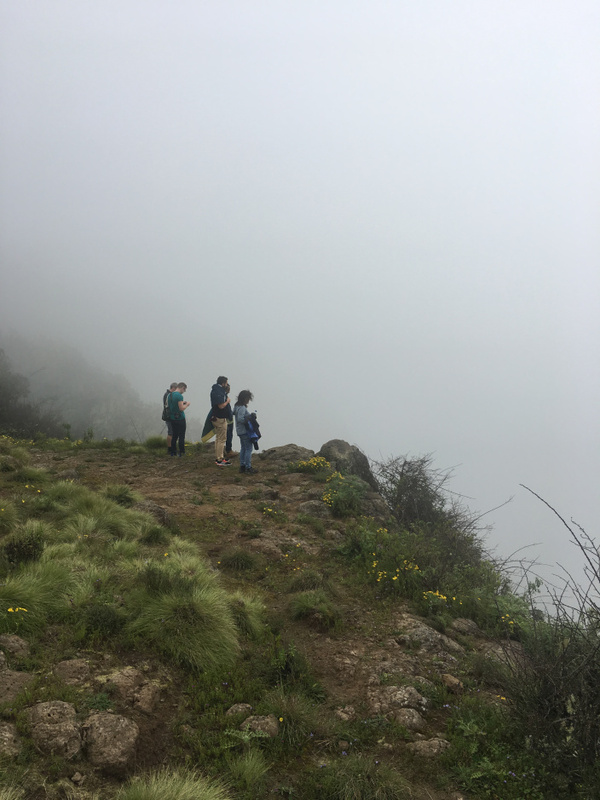 After a 30-minute flight, the hour-long drive to Lalibela took us up to an altitude of 2600 metres, the perfect height to take in the swathes of lush greenery below. We were staying in Hotel Maribela which was a simple but charming place near the centre of town. The staff were really lovely and couldn’t do enough for us. After a delicious lunch of chicken curry we made our way to the first collection of churches. The small town of Lalibela is a UNESCO World Heritage Site famous for its eleven medieval monolithic rock-hewn churches. Weaving history with legend, Lalibela is often referred to as the “New Jerusalem” and is set in an almost inaccessible mountain stronghold, nearly 2,368 metres above sea level. A photographer’s dream, the town is full of portrait perfect priests and the churches themselves are mind-blowing. 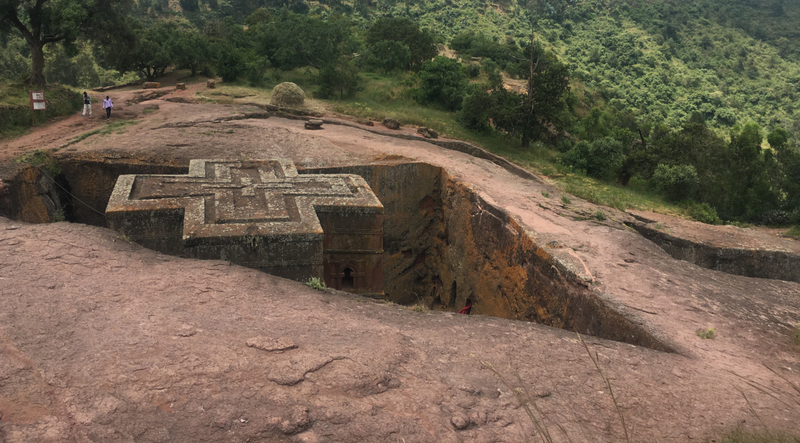 Built by King Lalibela over a 24-year period, more than 500 people toiled to carve them out of the rock, although legend has it that 12th century angels assisted them in their epic task. 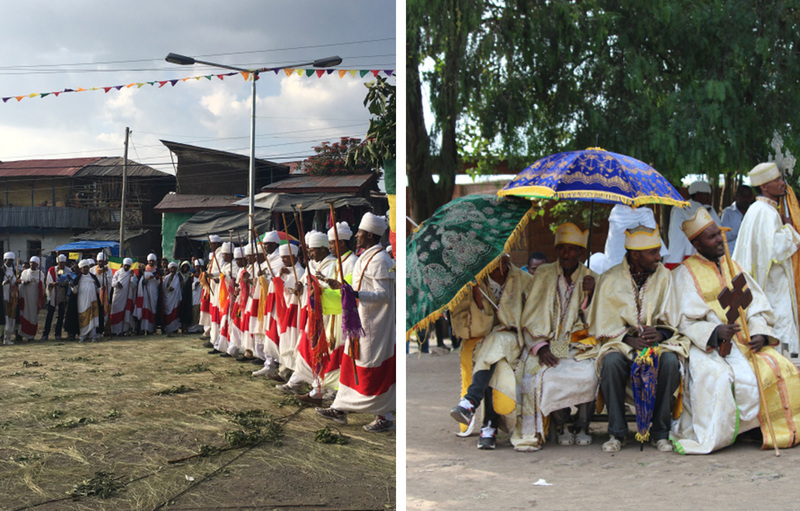 We were in Lalibella for the Meskel Festival Of The Cross. This colourful festival involved over 200 priests dressed in their finery dancing to the drumbeats and chanting in Geez, the language of the ancient church. In the midst of hundreds of school children who were singing, dancing and playing their drums, we felt like we had stepped back in time. After a day rich with new experiences, dinner at Ben Abeba was equally extraordinary. A hilltop restaurant built to look like a witch’s hat, its owner is a Scottish lady who ran an architectural competition asking entrants to come up with a design for the restaurant. The menu is a blend of local and European influences and I can vouch that the Ethiopian take on shepherd’s pie is delicious. The following morning we ventured 10 minutes outside of Lalibela to a rock-based monastery called Nakuto Laab. The water running through the rock lends it a rainforest feel. Dawit greeted a man who ran up to us wearing his farming clothes. He quickly kicked off his sandals, donned a shawl and unlocked the church. 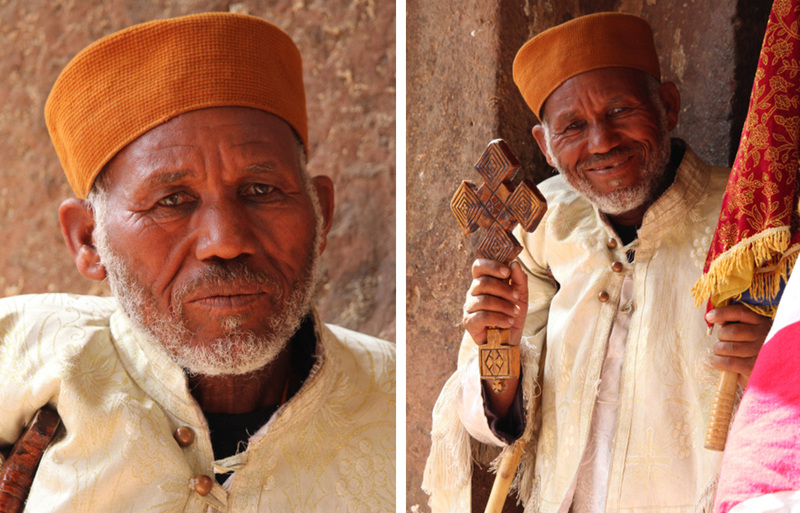 I recognised him as one of the most photographed priests of Lalibela. There were lots of young Ethiopians who had come on a pilgramage to visit the church. According to Dawit, having been discouraged from religion under communism, when the politics of the country changed in 1991, the youth became very active in their Christian worship – a trend that continues today. After lunch, we visited the second group of churches, including the famous Bet Georgis. This cross-shaped church, located in a deep pit with perpendicular walls, is only accessible through a tunnel. The other four churches of this group are Bet Emanuel, Bet Mercuiros, Bet Abba Libanos and Bet Gabriel-Rufa’el. Bet Emanuel’s elaborate exterior is frequently praised by art historians. Religious or not, you can’t fail to be impressed by the bewildering feat of architectural calculation that has gone into these buildings. Quite how they managed to get the proportions perfect and lines so straight when they were effectively building upside down, is staggering. The day was rounded off by a delicious traditional Ethiopian coffee ceremony before heading back to the hotel for dinner and the chance to experience some of the local nightlife. Dawit was keen to take us to a local Ethiopian bar. The bar’s patrons were a mix of local Ethiopians and a few tourists and the vibe was warm and welcoming. A musician wandering around playing a traditional Masinko, a one stringed violin, was soon accompanied by a brilliant drummer who increased the tempo. Encouraged to join in the dancing, additional entertainment came in the form of watching our group attempt to throw some Ethiopian shapes of their own. By way of reciprocity, we tried to introduce the dancer to a couple of new English moves, although I’m fairly confident they won’t be incorporated into his routine any time soon. 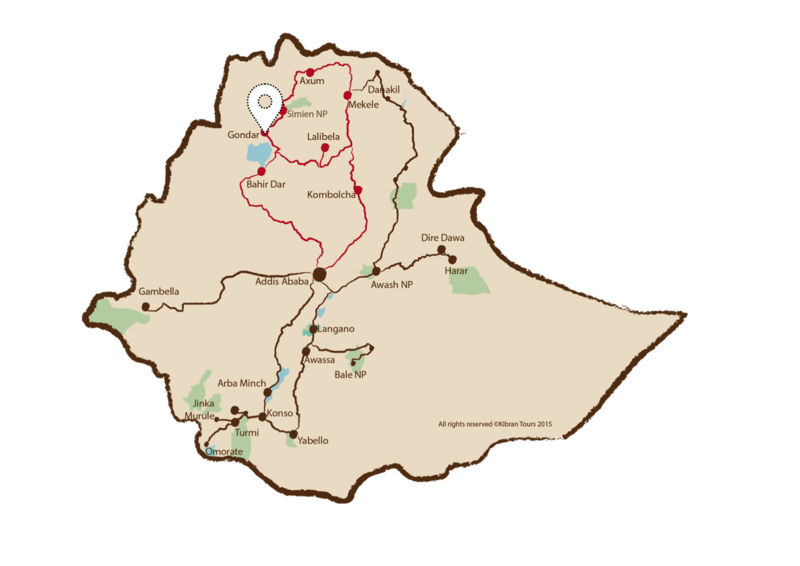 The next stage of our itinerary was taking us further south to Bale Mountains. We flew down on the scheduled Ethiopian Airlines flight to Addis before connecting immediately with our charter flight to Bale. 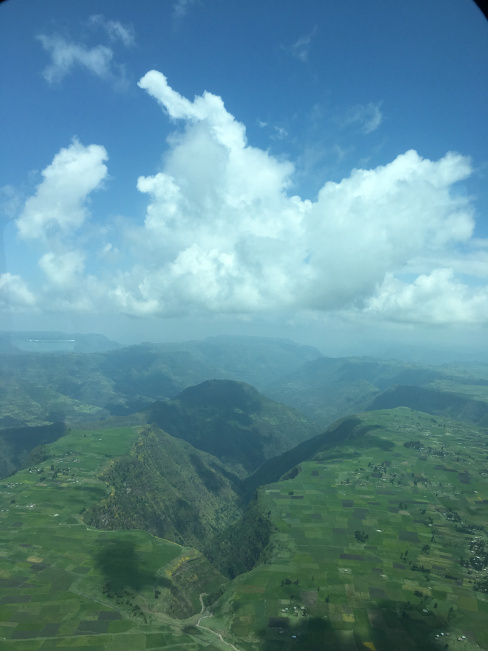 The scale and drama of the scenery as we swooped over the Rift was an unforgettable aerial reminder of just how incredible Ethiopia’s landscape is. When we neared Goba grass airstrip, I was delighted to see that the new tarmac runway at nearby Robe airport looked to be nearing completion. We hope that ET will soon be flying down there themselves… Watch this space. As we touched down at Goba airstrip, we were met by three sparkling white Kibran Tour 4 x 4s. However, the rain soaked drive up to the Bale Mountains National Park ensured they didn’t stay that colour for long. Bale Mountain National Park is known as ‘One Park Many Worlds’. From the Gaysay grasslands of the north and the high altitude Sanetti plateau, to the wild forests of the south, the amazing range of habitats support myriad rare and endemic species, many of which are unique to this Park. UNESCO has estimated that more mammal species would become extinct if the habitats of the Bale Mountains were to degrade than if any other area of equivalent size on the globe disappeared. 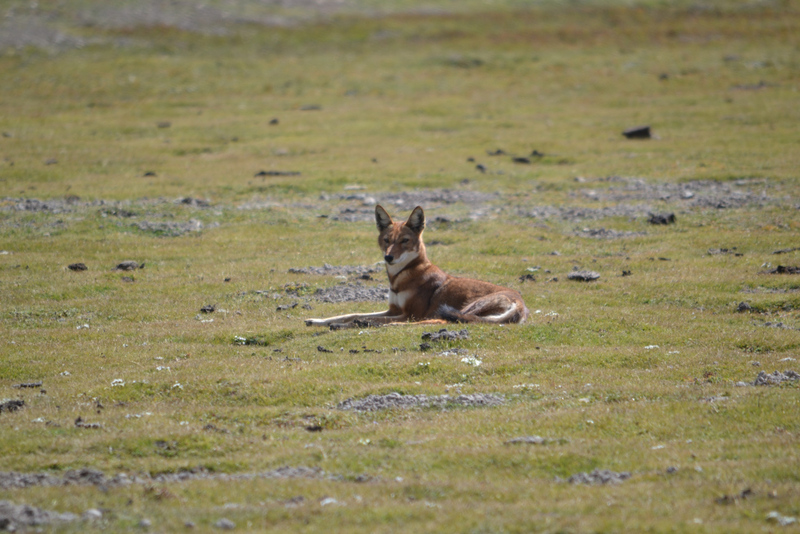 The main wildlife attraction, and almost an ‘icon’ for Ethiopian wildlife travel, is the Ethiopian Wolf. The Sanetti Plateau is home to the largest numbers of the remaining Ethiopian wolves. They are the world’s rarest canid and Africa’s rarest carnivore… and we were lucky enough to see one! The Sanetti Plateau is a pristine wilderness that incorporates the largest remaining tract of afro-alpine moorland on the continent. 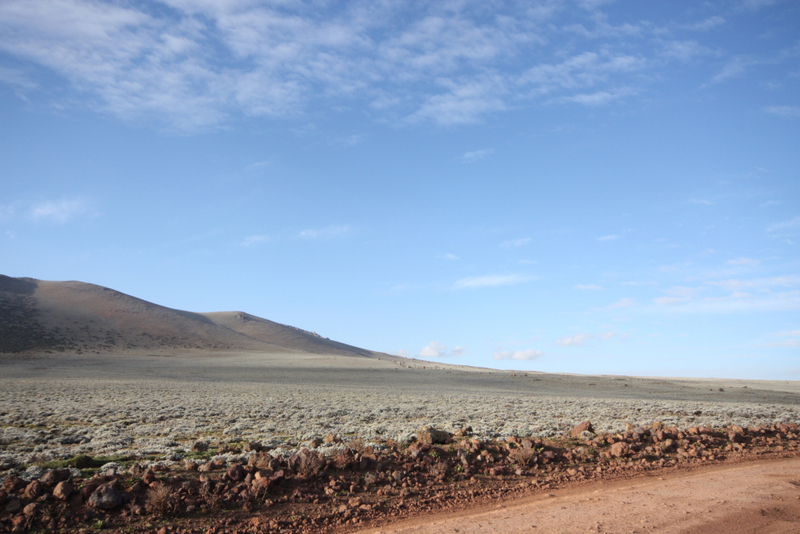 The majority of the plateau is over 3800m above sea level and you certainly feel it as you step out of the car. Fortunately, the chill and our laboured breathing were quickly forgotten as we caught our first glimpse of an Ethiopian wolf hunting in the distance. The wolves are relatively easy to spot due to the vast open landscape they roam across and the fact that they survive on the rodents that make their dens along the side of the road. 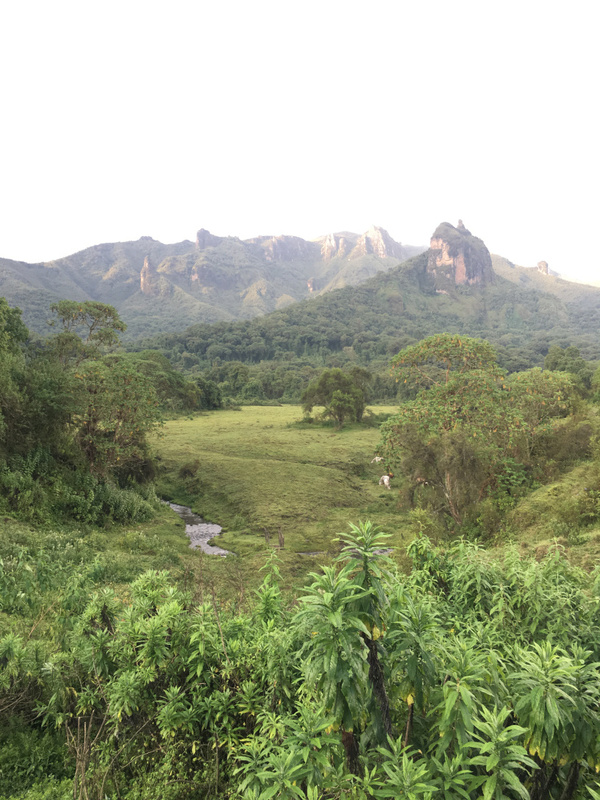 Bale Mountain Lodge is located in a clearing within the Harenna Forest of the Bale Mountains National Park, one of the largest remaining tropical Cloud Forests on earth. The lodge sits on a small hill 2380m above sea level. Overlooking a mountain stream with views of the 1500m high Harenna escarpment, its volcanic outcrops rise dramatically from the forest. 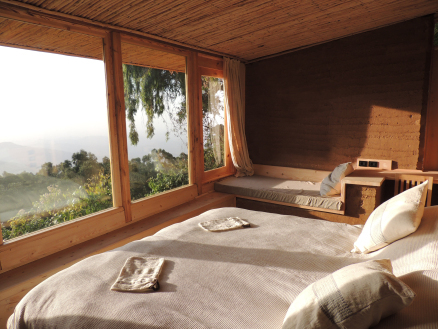 Bale Mountain Lodge is the brainchild of Guy & Yvonne Levene, an ex-British Army officer and his teacher wife. 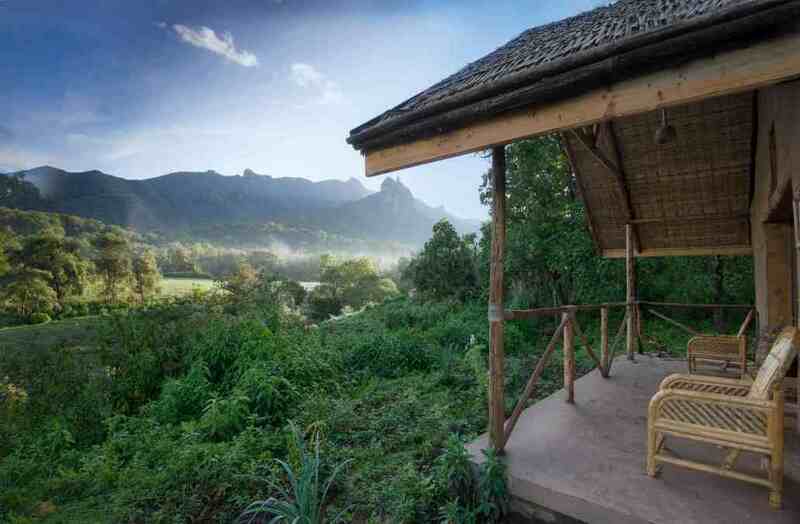 Working across Africa for 20 years and living in Ethiopia for six, they were inspired to bring the country the same comforable tourist accommodation available on the rest of the continent by creating a property with the very best ethical, conservation and community driven credentials. In true pioneer spirit, they jacked in their jobs and invested their life savings in making a difference. They began by writing the government legislation for investment in the National Parks (none had existed before) – work that set the environmental and community standards to which all future National Park investors must adhere. 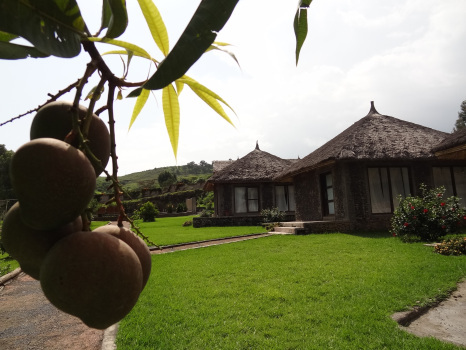 The lodge is now the largest financial contributor to the Bale Mountains National Park, and employs 23 local staff who have all been taught transferable skills in housekeeping and the lodge’s kitchen staff have been trained to cook international meals under the guidance of a qualified chef. 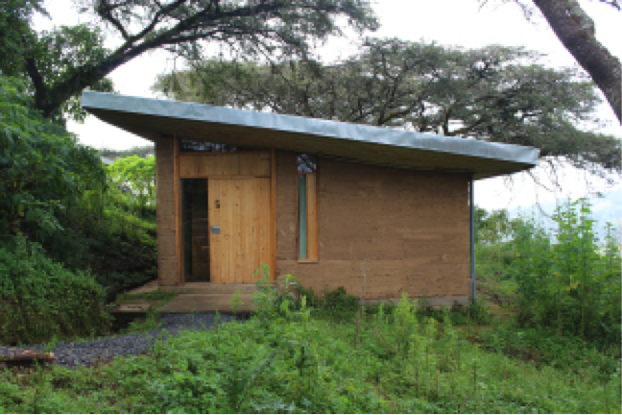 The lodge was constructed using state of the art technology to make it sustainable and eco-friendly. Electricity is hydro-powered by the river, they have their own water filtration systems and further purification works which means water can be safely returned to the river after use. Bio-gas is produced and natural, sustainable materials were used in construction where possible. The independent Environmental Impact Assessment, which was produced by the government to measure the success of the project, estimated that the lodge would have a 35% positive effect on the environment over the course of its first 10 years of operation.The Park is a birdwatcher’s paradise and has been rated ‘4th best birding site in Africa’ by the African Birding Club. The National Park harbours some 18 endemic species along with large numbers of migratory birds and passage raptors alongside the resident populations. As the day dawned, it was clear that the weather wouldn’t be playing ball which meant we couldn’t climb Mount Gushralle in front of the lodge or go on a bird walk. 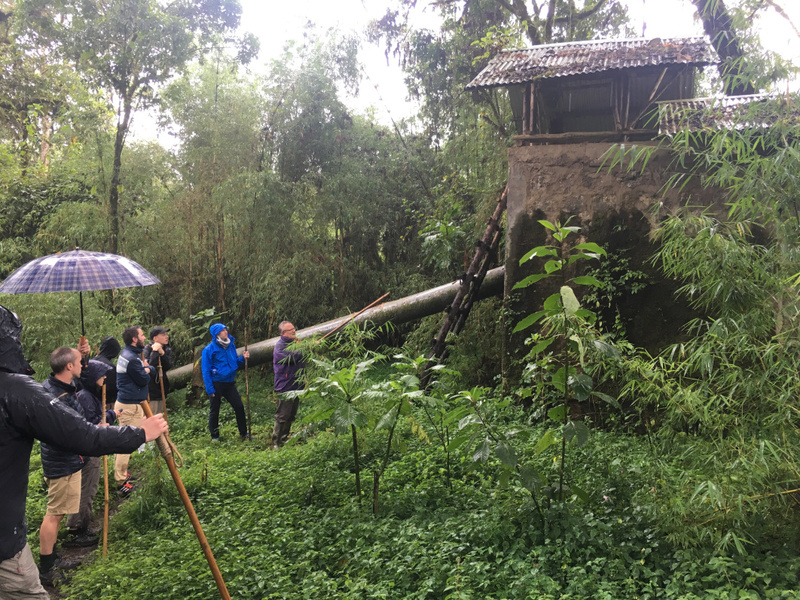 Determined that the rain wouldn’t completely ruin our plans, we dug out our waterproofs and trekked into the rainforest to check out the micro hydro plant and the new sauna that’s almost finished. After a long, lazy lunch it was time for a few hours relaxation and the opportunity to soak up the views. Some broke off to go for a walk around the lodge while others ventured into the village for coffee and honey with the added bonus of seeing the endemic Mountain Nyala and a family of colobus monkeys. In the evening we went for a night drive and while we sadly didn’t spot the black maned lions, we did spy some hyena and bush buck in the grounds of the lodge. Despite Addis being a nine-hour drive from Bale, the journey wasn’t an arduous one thanks to the decent roads. After a quick freshen up at Addis’ Golden Tulip, we were whisked off to meet Assefa from Kibran Tours who was treating us to a farewell meal at Castelli, one of the city’s oldest restaurants. The Italians marched into Ethiopia in 1935 and left six years later minus those few Italians who chose to stay on. One of those who remained, was soldier Francesco Castelli who opened his restaurant in 1948. According to Sir Bob Geldof, it’s the best Italian in the world bar none! Part of the charm of the place, say regulars, is that it hasn’t really changed in the last half century. After a quick site inspection and drink at the Sheraton, we hightailed it to the airport for our flight home. The more I work with Ethiopia the more I realise how far removed the reality is from the many misconceptions that exist about this spellbinding country. The group couldn’t conceive that our green, lush surrounds were the site of the cruel famines many people still associate with Ethiopia. The nation needs and welcomes tourism. From the astonishing rock-hewn churches of Lalibela in the north to the lakes and beautiful rolling hills in the south, it is a land of awe-inspiring contrasts that even the most seasoned travellers felt privileged to experience.